Multiple bomb blasts, Wednesday morning, rocked Mauduguri, the Borno State capital. 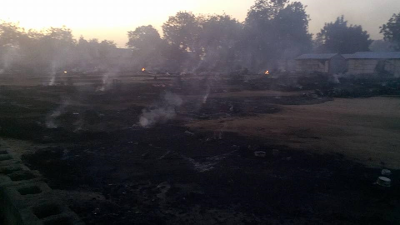 DAILY POST learnt that three suicide bombers attacked the Gulumba temporary Internally Displaced Persons, IDPs, camp at about 3am. The camp is opposite Muna garage in Maiduguri. According to information gathered, the incident led to the loss of several lives. Residents of the area, however, said that, many people were killed in the multiple blast contrary to figures given by the Police and NEMA. Alhaji Idi Mai Bukar told our Correspondent that more that 13 were said to have been confirmed killed in the attacks, while over 20 people are in critical condition at the UMTH and State Specialists hospital. ” We did not count corpses, we were busy trying to save lives. I participated in the early evacuation before the police even arrived the scene. I cannot quote figure because I am not an authority but what I know is that many people were killed and a lot more got injured in the blast. We are always praying to see the end of this evil,” he said.